If you live in a cold climate where snow and ice on your windshield are pretty common, you know that it is impossible to see if you don’t clear your windshield. Though CD cases and other objects with an edge can get that ice cleared away, the right tool for the job, which won’t damage your windshield is a snowbrush/ice scraper. Believe it or not, there are some features of these simple tools that will make the job much easier. Our snowbrush/ice scraper reviews and buyer’s guide will help you find the one that best fits your specific needs. Let’s get started by comparing a few available models. A great example of a snowbrush/ice scraper that will get the job done without any added extras is the Mallory 532 26″ Cool Tool Snowbrush with Integrated Scraper. This tool is durable, but lightweight and includes enough length to reach over your windshield. It comes with a sharp edged ice scraper with prominent and durable ice-cutting teeth to get through stubborn ice. 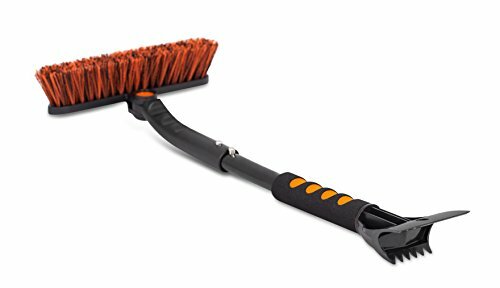 You get a foam grip toward the scraper end of the handle and the opposite end features a brush with 4 rows of bristles at a 90 degree angle to the scraper so it won’t get in the way while you work. • Durable design with adequate reach for most users. • Handle includes a curve for improved leverage. • Includes foam grip for a non-slip grip. • Durable scraper with prominent teeth. • Bristle brush for snow removal. • Might not be long enough for shorter users. • Is not particular compact, so it will take up quite a lot of space in your car. • Some users report issues with the bristles falling out of the brush during use. A more compact tool with some convenient added features is found in the BIRDROCK HOME Snow Moover Small Car Brush and Ice Scraper. The highlights of this unit are its very large ice-cutting teeth and its fuller bristled brush, which includes a handy pivot feature. 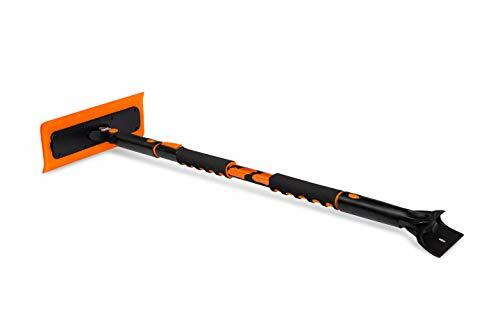 This is a lightweight and durable tool with a foam grip toward the scraper end of a 20” handle, making it a bit more compact for easier storage. Its ice scraper is made of solid material and its cutting teeth can really dig into stubborn ice. • Durable, compact and lightweight. • Handle features a foam grip and is made of durable material. • Brush head is fuller and has a pivot feature to assist with reach. • Durable scraper with large, ice-cutting teeth. • Higher price than the average. • Might not work well for shorter users. • Pivot feature is a potential weak point. To get a little more reach out of your snowbrush/ice scraper without a folding or telescoping feature, the True Temper 28-Inch Scratch-Free Snowbrush, is a quality option. This tool features an aluminum handle for added durability without added weight. It features a foam brush head that has a durable plastic blade center for plowing snow as you remove it. You get a durable scraper with large ice-cutting teeth to get rid of ice as well. • Durable aluminum handle provides a little bit more reach to user. • The foam brush allows for snow plowing during removal. • The ice scraper is durable and features very prominent ice-cutting teeth. • Longer tool that is more difficult to store. • There is no foam grip to prevent your hand from slipping. • Leaning toward the pricey end. Those who are short or using their snowbrush/ice scraper on a much larger vehicle will appreciate the dimensions of the BIRDROCK Home Snow MOOver 55″ Extendable Foam Snowbrush and Ice Scraper. The reach of this tool is almost enough to reach over your car and clear the ice and snow from the one parked beside yours. At minimum extension, this tool is 40 inches long and at maximum it is 55 inches long. You get a durable, telescoping handle with foam grips at both the brush and scraper ends. It features a durable foam brush and squeegee for plowing snow from your windshield and a hard scraper with prominent ice-breaking teeth. • This tool has plenty of length, extended or compacted, to extend the user’s reach. • Brush and squeegee are both featured on a pivoting head. • Ice scraper includes very large ice-cutting teeth. • Foam grips are featured at both ends of the unit. • Even at its smallest configuration it is going to take up a lot of storage space. • Mechanic portions are potential issues waiting for you down the road. The Mallory 581-E Telescoping 48″ Sport Utility Snow Broom has plenty of features and plenty of length to keep SUV owners happy. You get a telescoping handle which is 30 inches long when closed and 48” long when extended. This unit comes with a combination brush and squeegee head for greater versatility. Its scraper end includes a foam grip on the handle, a durable edge scraper and ice-cutting teeth on the backside. 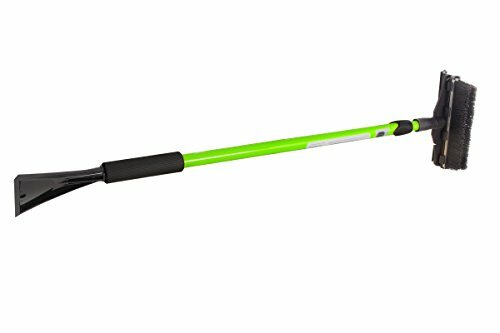 • Durable aluminum handle with telescoping extension for longer reach. 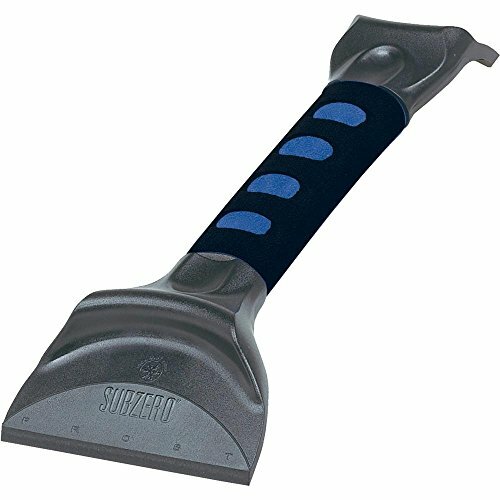 • The convenience of a broom and squeegee combination head. • Foam grip featured at the scraper end. • Durable scraper blade with ice-cutting teeth. • Pretty bulky to store, even when in compact form. • Ice-cutting teeth are a bit small to be really effective. • Lack of curvature to the handle does not allow for improved leverage. The ice scraping feature on the Hopkins MO14021CB Break-Up Country 32″ Snowbrush with Integrated Ice Scraper is its most prominent feature. With its more prominent ice-cutting teeth, this scraper can really dig into the ice on your windshield. This unit also features an aluminum handle with decent length for most users and a snowbrush on the end opposite its durable scraper. A foam grip is featured near the scraper end of this tool where it is most needed. 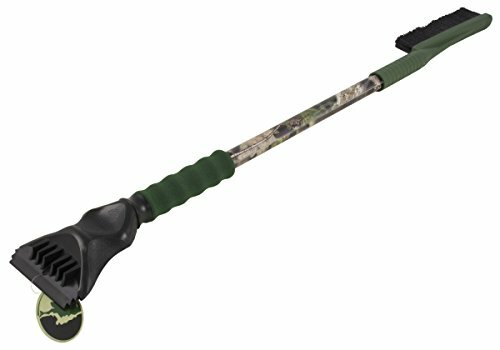 • There is plenty of durability built into this tool. • It features an aluminum handle of decent length and a grip toward the scraper end. • The ice-cutting teeth of this unit are its most impressive feature. • The scraper is of durable construction as well. • The brush head is a bit underdesigned. • It is a pricey option for what you’re getting. • It is still a bit bulky for storage. The Hopkins 2610XM SubZero 52″ Super Extender Snowbroom with Integrated Squeegee and Ice Scraper provides you with all the features you could want in a snowbrush/ice scraper along with extended reach. The durable telescoping aluminum handle on this unit collapses to 35 inches and extends out to 52”. Included features of this tool are a squeegee, brush combination head, a durable scraper blade and a foam grip handle near the scraper end of the unit to prevent your hand from slipping. • Durable handle construction with plenty of length to extend your reach. • Hardened ice scraping blade. • Foam grip near the scraping end of the unit. • Combination squeegee and brush head for greater versatility for light or compacted snow removal. • Leans toward the pricey end when considering what you get. • The absence of ice-cutting teeth is a potential issue. • It is still pretty bulky for storage when collapsed. Those who deal more with ice and not so much with snow will appreciate the compact design and simplicity of the Hopkins Subzero 16621 Ice Crusher Ice Scraper. This tool comes with a durable 11 inch handle that allows for much easier storage in your vehicle. It is lightweight, features a foam grip to prevent your hand from slipping and includes a durable scraper blade. Ice-cutting teeth are featured opposite the scraper blade on this tool so that you can really dig in on heavier ice deposits. • Compact and lightweight for greater use convenience and storage. • Foam grip handle prevents your hand from slipping as you bear down. • Includes both a scraper and ice-cutting teeth. • Does not accommodate snow removal. • Ice-cutting teeth could be more prominent. • You don’t have a lot of reach with this tool. Though a simple tool, various features make one snowbrush/ice scraper more effective and easier to use than another. Our buyer’s guide will provide you with information concerning which characteristics will best serve your needs as well as answering some of the most common questions about snowbrush/ice scrapers. Why do you need snowbrush/ice scraper? 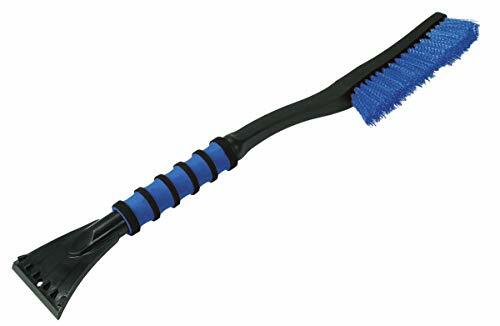 Basically, if you live any place where snow and ice are a common occurrence in the fall, winter and spring, you need a snowbrush/ice scraper in your vehicle. The reason is that it is the quickest and most efficient way to remove snow and ice without doing damage to your windshield or the rest of your car. Are there ways to prevent snow and ice from building up on your windshield? Park your vehicle in the garage or under a carport. However, if you do not have these options available and you live in an area where things you leave outside at night will still be there in the morning, you can cover your windshield with a blanket or cover your whole car with a car cover. Can you just use spray-on de-icer? Spray-on de-icers often contain chemicals that are harmful to your car’s finish. Those that do not contain these chemicals can be expensive. If you want to go this route, consider the frequency of snow and ice accumulation along with the cost of how much de-icer you will need as compared to the cost of a snowbrush/ice scraper. Which snowbrush/ice scraper works best for shorter people? A snowbrush/ice scraper with a longer handle will make it easier for short people to reach. However, be sure that the handle is durable enough to hold up when you apply pressure, so it won’t bend or snap off in your hand. A curve to the handle also helps shorter people to obtain better leverage for scraping. How is snowbrush/ice scraper best used? The bristled or brush end of a snowbrush/ice scraper is used to clear snow away from the windshield so that you can get at the ice underneath. In addition, it comes in handy to remove the scraped ice from the windshield after scraping. The scraper end, when pressure is applied, cuts through the ice on your windshield using a moderately dull blade. Some scrapers include teeth, which also help to dig into the ice. What is the difference between a Swedish ice scraper and a regular ice scraper? You may or may not have heard of a Swedish ice scraper. For what sounds like a really fancy name, sort of like frying bread in eggs and calling it French Toast, it is a pretty simple tool. Essentially, it is a laser-cut and diamond polished piece of plastic with a sharp edge, which is useful for scraping ice. It does not typically have any teeth and the edge often has an angle cut instead of being straight. It works for scraping ice and will fit in the glove box of your vehicle. Do some snow bush/ice scrapers work better than others in certain regions? Mostly, they all work the same. Areas where ice, rather than snow accumulation, is more apt to be the issue will do fine with a Swedish scraper. Where snow accumulation is likely, the snowbrush is pretty handy, so you don’t have to brush it off with the sleeves of your coat, your mittens, or worse, your bare hands. What are some features to look for in snowbrush/ice scraper? Getting your hands on a quality product will require comparisons in order to know that you are getting the very best value for the money you spend. There are some general features of quality snowbrush/ice scrapers, which can help to form a standard for comparison. Using this standard, you are more likely to the most important features you need for the investment you make. The blade on the scraper end of your snowbrush/ice scraper needs to be fairly sharp, but not quite like a knife edge. It also needs to be made of durable material, because you will be bearing down on it and you don’t want it to snap. Some models will add a metal blade to the scraper end. This is another component and potential weak point. If the blade is securely attached, it can be an asset, if not, it renders the scraper end useless. Better snow scrapers include teeth on the back edge of the scraper. These teeth should be prominent and durable for them to be helpful to you at cutting through the ice without making you have to scrape your knuckles over the sharp surface of the ice as you bear down to scrape. The handle of your snowbrush/ice scraper will vary from one scraper to another. It might be long, short, curved, telescoping or folding. Each has its advantages and disadvantages. • Long handles make it easier to reach farther, but take up more space. • Shorter handle takes up less space in your vehicle, but limit how far you can reach. • Curved handles allow you to apply more leverage to scraping, but may present storage issues. • Telescoping and folding handles allow you to collapse them for storage, but the mechanics need to function properly or they become useless. Regardless of the size, shape and mechanics of the handle on your snowbrush/ice scraper, it needs to be durable enough to hold up under the pressure you apply when scraping ice. There are several brush head configurations available and they each have advantages and disadvantages. The most common is a simple, bristled head for sweeping snow and ice scrapings from your windshield. Other models incorporate a squeegee into the head for pushing snow off your windshield or have a foam head for sweeping off snow instead of bristles. The bristle head is really the most valuable option on this portion of your tool. Scrapers with squeegees are nice for helping to remove packed snow, but most people use the scraper end to do this if their model doesn’t include a squeegee, making it an extra feature you will pay more to include. A foam head might reduce the cost of your tool, but they really aren’t as efficient as a bristle head. You want a tool that has a foam, non-slip surface for a grip. Remember that you will be bearing down to scrape ice and you don’t want your hand to slip while you’re working. The grip also needs to be closer to the scraper end of the handle where you will need more leverage. Some models add a glove or covering to the handle, mostly on Swedish scrapers, which is really just something you will pay extra for and don’t really need. If you want gloves or mittens for scraping snow and ice off your windshield, put on a pair. Working with a heavy tool always leads to greater fatigue, but a lightweight tool is unlikely to have the durability it needs to hold up under applied pressure. Do your best to strike a balance between the two extremes in order to get the most value out of the tool. Those who live in cold weather climates know that scraping snow and ice from your windshield is inevitable. Even if you take precautions to prevent it (parking in a garage, under a carport, or using a car cover), at some point, your car will be exposed to snow and ice. Having a snowbrush/ice scraper at hand will allow you to quickly clear away this small inconvenience and be on your way. Our reviews and buyer’s guide have provided you with the necessary information to make a qualified comparison between various models. With this information, you should be able to choose the snowbrush/ice scraper, which best serves your needs.